present an incentive or call-to-action to a departing visitor. At present, this trigger only works on desktop screens where a mouse or trackpad controls a cursor inside a browser window. It does not work on mobile devices, which rely on screen touch. We are researching possible solutions for use on mobile devices, and hope to introduce them in the next release of the Exit Intent plugin extension. false positive delay, which monitors the length of time that the cursor remains near or above the top of the browser. By default, top sensitivity is set to 10 pixels (px). When a cursor moves to within 10px of the top of the browser window, the trigger fires and displays a popup. The default setting is intended to limit accidental popup displays if the cursor is positioned near the top of a page. By default, false positive delay is set to 350 milliseconds (ms). When a cursor moves to within the top sensitivity margin, and remains in this area longer than the option setting, a popup will display. The setting is intended to prevent accidental popup displays if a user quickly moves their cursor from above the browser window back onto the page. Visit the Exit Intent example page to test the plugin using different option settings. Please note: Due to security updates in modern web browsers, the custom messaging feature provided by the Exit Prevention trigger is no longer available. That trigger should be ignored, and is no longer usable. For more information on how to create a high conversion popup, view the following article from our Conversion, Marketing, and UX Blog. Once the Exit Intent extension is installed and activated, either open an existing popup or create a new one in which to set an Exit Intent trigger. Open the Popup Editor, and scroll to the Popup Settings box. Select the Triggers option tab. 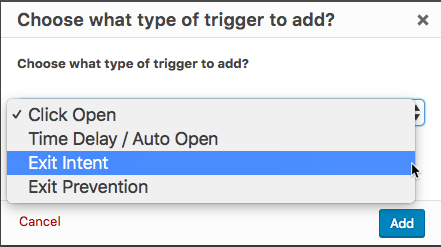 Select the Add New Trigger button to open the trigger selection box. Choose 'Exit Intent' from the drop down menu. 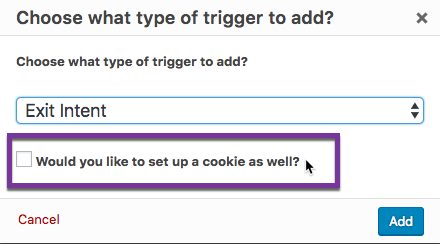 The trigger selection box also provides the option to add and link a cookie to the trigger. Cookies control the repeat display of popups in the browser. To work, they must be set and linked to a popup trigger. By default, a cookie is not set and linked to the Exit Intent trigger ( checkbox = 'unchecked' ) when the trigger is added. The trigger can be edited later to add and link a cookie. 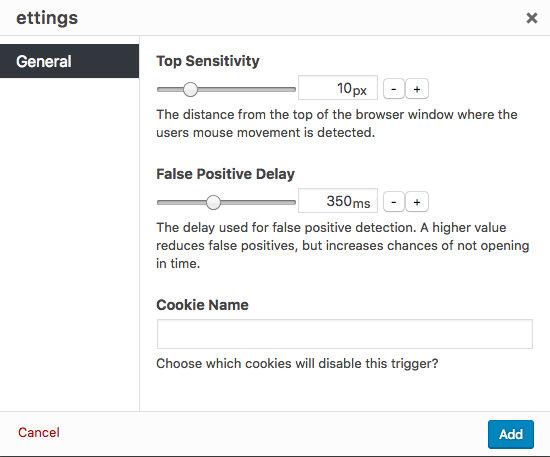 If you decide to add a cookie while setting the trigger, refer to the following related article on cookie menu options. The Exit Intent trigger provides 2 option settings; top sensitivity, and false positive delay. Each setting can be modified using either the range slider, or by entering a field value (located to the right of the slider). Both option setting fields accept any value greater than the initial default maximum. The range slider will automatically reset the maximum, and display the new input value within the adjusted range. Top Sensitivity -- Default: 10 px (pixels). This defines the distance from the top of the browser window where the visitor's cursor movement is detected. How close do you want the visitor's cursor to get to that border before the popup is opened? We recommend sticking with the default value of 10px. It can be adjusted for specialized popups or testing. False Positive Delay -- Default: 350 ms (milliseconds). This defines the time delay for recognizing cursor movement near or above the top margin of the browser window. If a visitor moves their cursor above the browser, and then quickly moves the cursor back in within the time delay period, the popup will not trigger. The delay is intended to reduce a 'false positive' trigger event, and display the popup only to visitors who are intent on leaving the page. The settings represents a fine line between too much and not enough delay time. We recommend sticking with the default time delay until you know what works best for you. Note: If the false positive delay time is set too high, and a visitor closes the browser window before the delay period ends, the popup will not be seen. If you have not set and linked a cookie to the Exit Intent trigger, we recommend at this point that you add one. This will prevent a popup from repeatedly displaying every time a visitor moves their cursor outside the browser window. Visitors who return to the site repeatedly may find the popup display annoying if it displays each time they move their cursor outside the browser window. Select an acceptable expiration time for the cookie. The default value is 1 month. Cookies are set from the Popup Settings box >> Triggers option tab. Select the button labeled Add New Cookie to begin the process. See the related article below for guidance on how to set and edit a cookie. Select the Publish or Update button to save any changes to the popup. Visit the front-end of the site and test the popup. If a cookie is set and linked to a trigger, it will prevent the redisplay of the popup for the term set in the 'Cookie Time / Settings' field. The cookie can be cleared from the browser using the Popup Admin Toolbar. See the related article for details on this feature.